Abstract: A few days ago Kingston announced a new memory packaging technology called "EPOC" - and no this isn't a Matrix II spinoff. Kingston Technology are a memory vendor you should be familiar with. If you have PC2700 DDR or PC1066 RDRAM chances are you've looked over a kingston memory module at least once in your search for the best price. 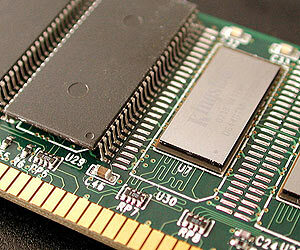 We've tested Kingston DDR and RDRAM on one or two occassions and the quality level has always been pretty good. A few days ago Kingston announced a new memory packaging technology called "EPOC" - and no this isn't a Matrix II spinoff. EPOC stands for Elevated Package Over CSP (Chip Scale Package) and what it describes is a better way of making high-density DRAM modules. This isn't quite at the consumer level yet since they are dealing Registered RAM at the moment, but given the ease and robustness of the new manufacturing process it may be in our hands very soon. EPOC was developed with server memory in mind. Servers are very crowded devices and there isn't much room in a 1U, 2U or even 3U rack mount system for many DIMM slots. DIMM slots are where the DRAM gets clicked into place, and typically there are four on a motherboard. With only four slots to populate, there is a natural barrier to how much memory can physically be installed in any one system. Typically memory modules max out at 1GB - and since it is very, very expensive to achieve this level of memory density using 16 individual TSOP-II chips (Thin-Small Outline Package), manufacturers use a few tricks. One of the most widely used techniques is to stack lower density memory chips on top of one another - usually to a height of two, but sometimes three. Making memory with this process is not too complex, but it can be time consuming, and cause delays if the solder joints are not perfect the first time around. "Kingston engineers worked closely with Payton Technology Inc., a Kingston subsidiary dedicated to specialty chip packaging and testing, to develop this new technology. "This joint Kingston-Payton project demonstrates the benefit of Kingston's Express Wafer-to-Module program, which results in Kingston's faster response to customer orders without jeopardizing quality or reliability," said Daniel Hsu, general manager, Payton." The 1.2" tall modules use a 3-dimensional memory module system where one chip essentially sits overtop of another. Neither chip makes direct contact the one adjacent and this helps to ensure adequate convection cooling. Were the TSOP and CSP chips to be in direct contact with one another, the combined heat from each module could pose problems. The exposed DRAM chip is a raised Thin-Small Outline Package (TSOP) memory type which is standard to most of todays memory sticks. Below this chip lies a BGA mounted, and smaller, Chip Scale Package (CSP) memory chip. According to Kingston the idea came about when they "first set out to eliminate the long lead-times required to stack memory chips when using third-party stacking companies." "Kingston engineers also set a design objective requiring the new technology to be as easy to manufacture as standard modules." 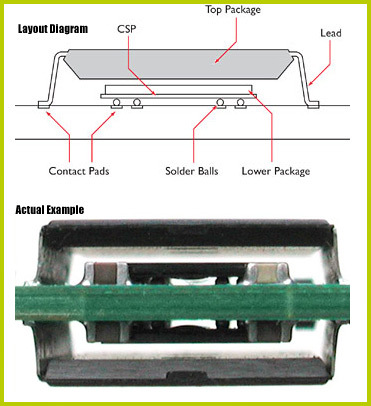 Because the two types of memory chip solve the problem of memory density, and each make direct contact the PCB, the manufacturing process is greatly simplified, and hence, more reliable.